The Center for Global Reproductive Health’s Research Coordinator, Yujung Choi, and I held a dissemination meeting on October 19th to share the findings from one of our studies. 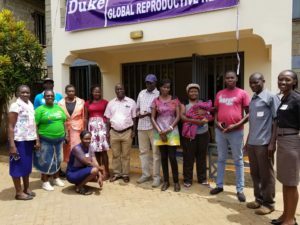 The study describes the characteristics, motivations, and experiences of community health volunteers (CHVs) in Kisumu county, and looks to understand CHV knowledge and self-efficacy of reproductive health counseling and services. 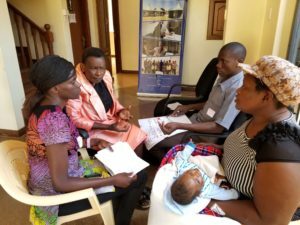 The purpose of the meeting was to share the study outcomes with key stakeholders and elicit feedback in order to inform future interventions to measure CHV performance and increase CHV retention rates. Among those who attended the meeting were CHV supervisors who had participated in the study, Sub-County Community Health Strategy Focal Persons, a former study staff, and a Program Officer from the NGO Community Initiatives Concerns. This interactive group session generated productive discussions on strategies for reducing some of the identified challenges going forward. We hope that they will provide guidance to improve CHV workflow, satisfaction, and retention rates, which will in turn improve quality of care for women.